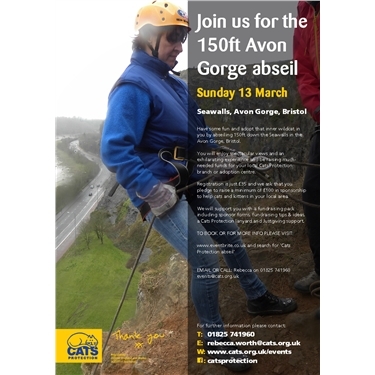 Have some fun and adopt that inner wildcat in you by abseiling 150ft down the Seawalls in the Avon Gorge, Bristol. You will enjoy spectacular views and an exhilarating experience and be raising much-needed funds for our branch. Last year was a roaring success raising over £8000 for branches and adoption centres – many branches had members of the public sign up and support them, who hadn’t fundraised for them or been in touch before. Bristol had 2 abseilers take part who had adopted cats years earlier from them, all in all their 3 supporters raised over £700 for their branch. Registration is £35 and we ask that you pledge to raise a minimum of £100 in sponsorship to help cats and kittens in your local area. We’ll support you with a fundraising pack including sponsor forms, fundraising tips and anything else you might need. Do contact Rebecca Worth, Regional Fundraising Manager on the below details if you have any questions or would like any further information.